In the first game of this weekend’s action, Belgrano’s good form continued as they beat Godoy Cruz 1-0 for a third consecutive league win. The deadlock was broken midway through the second half when Guillermo Farre got the wrongside of the stumbling Emanuel Insua and was brought down in the box for a penalty. Claudio ‘Chiqui’ Perez stepped up and calmed sent the keeper the wrong way for the win. Rafaela put three past Tigre to leave their beleagued opponents still searching for a first win of the campaign. An early penalty got La Crema on their way, Cesar Carignano coolly slotting home from 12 yards. Tigre had the opportunity to level the score with a penalty of their own but Guillermo Sara kept out Emanuel Pio’s effort. This would prove to be the game’s turning point as a headed goal from Lucas Bovaglio and then Cristian Machin finishing off a swift counter attack, wrapped up the victory for Rafaela, who are now on a three game unbeaten streak. Argentinos Juniors threw away a two goal lead against Union in a dramatic 3-3 draw at the Estadio Diego Armando Maradona. Marcos Figueroa put Argentinos ahead when he converted Leandro Barrera’s devilish cross and then grabbed another as he latched onto Gaspar Iniguez’s through ball to squeeze in his second of the afternoon. Shortly after half time, Diego Jara saw his penalty well saved by Luis Ojeda but scored the rebound to reduce the deficit. But Figueroa completed his hat-trick, using his predatory instincts to flick home Anibal Matellan’s header, to restore los bichos colorados two goal cushion. The game should have been dead and buried as Argentinos looked well on the way to third win in four but with 7 minutes to go they could only half clear a corner that fell to Diego Barisone, who fired in to give Union a glimmer of hope. And in the dying seconds of the game, a poor defensive back pass from Diego Placente allowed Pablo Magnin to steal in and head a dramatic equaliser. A great fight back from Union whose third consecutive draw is clearly beginning to breed the confidence they will need if they are to beat the drop this season. 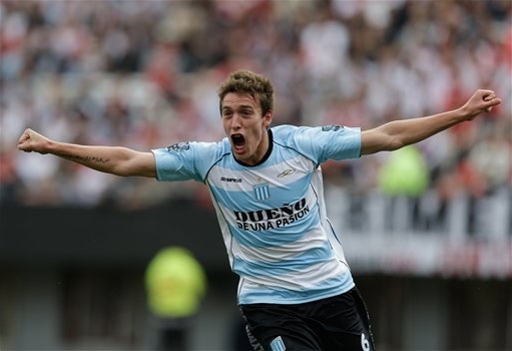 A brace for Facundo Ferreyra saw Velez (briefly) go top of the table after a good 2-1 victory away to San Lorenzo. Chucky Ferreyra grabbed his first when Lucas Romero’s deep cross was knocked down by Emiliano Papa, leaving the young striker free to ram home his first for the club. Ex-Everton striker Denis Stracqualursi levelled the tie slamming home after some scrappy pinballing in the box but Ferreyra won the game with a precise, well-taken goal after being slipped in by Lucas Pratto. Although Independiente are still in pursuit of their first league victory, lady luck shone on them this Saturday against All Boys as they came away with an undeserved draw. Midway through the second half, in-form striker Ivan Borghello put the visitors ahead, tapping into an empty net after Mauro Matos had sprung the offside trap and unselfishly laid it off rather than shoot. A late equaliser from Ernesto Farias however managed to rescue a point in bizarre fashion. An All Boys clearance rebounded off Osmar Ferreyra and onto the bar before landing at the feet of a probably off-side Farias who contrived to stab it home. The draw is Independiente’s fourth of the season and with no wins in 17 games (!) los Diablos Rojos are firmly embroiled in the relegation battle. In the biggest clash of the week, Racing bravely held on to claim victory in the clasico versus River. One goal was enough to seal Racing’s second away win of the season and heap the pressure on River boss Matias Almeyda. Cahais timed his run to perfection and thumped home a powerful header from Diego Villar’s free kick for the decisive goal. Sebasitan Saja produced a wonderful save to keep his side in front and Racing duly hung on to claim the bragging rights and the three points. San Martin don’t win often but when they do, they win in style. Though they have only won twice, on both occasions they have done so by a margin of 4 goals to nil, with Quilmes the victims this time around. Gaston Caprari and Humberto Osorio Botello both headed home as San Martin raced into a surprise early lead. Miguel Caneo missed a glorious opportunity to score from the penalty spot for Quilmes and it proved decisive as Jorge Luna made it three just before half time with a drilled low free kick from the edge of the area. Luna was once again the architect as he set up Sebastian Penco to turn the game into a rout with ten minutes to go against a shell-shocked Quilmes side. Newell’s edged title rivals Colon 2-1 to go top of the table on Sunday evening. Colon started the brightest with Ruben Ramirez twice going agonizingly wide in the opening 10 minutes but it was Newell’s who took the lead after Martin Tonso beat the offside trap perfectly and then Ignacio Scocco following up to score the rebound and take his tally to six for the season. On the hour mark Newell’s doubled their advantage when right back Marcos Caceres finished off a wonderful sweeping team move. Talented young playmaker Lucas Mugni pegged one back after his free-kick cross evaded everyone and went straight in, making it 2-1. Newell’s resisted fierce pressure as the minutes ticked down but hung on to claim a big three points. By contrast, Colon, after a good start, have faltered of late and are now without a win in 4 games. Former Boca legend Guillermo Barros Schelloto came back to haunt his old club as his Lanus side won 2-0 on Sunday night. Despite the best efforts of Rolando Schiavi, a costly fumble from Oscar Ustari allowed Mario Regueiro (later sent off) to thunder in the opener for the home team and Diego Valeri sealed the win late on with a cool finish. Boca’s dropped points sees them leapfrogged by both Newell’s and Velez and keeps things very tight at the top with numerous sides still in with a title shout. In the final game of the week, Estudiantes emerged victorious against Arsenal coming from a goal behind to win the game 2-1. Carlos Carbonero put Arsenal ahead with a fantastic effort from the edge of the area against his parent club but a rare howler from Lisandro Lopez cancelled it out not long after. Gaston Fernandez hit the post and it came out to Lopez who, six yards out, miscontrolled the ball into his own net. Estudiantes’ second goal also had a touch of fortune about it. It was Fernandez once again with the effort but his shot hit an Arsenal defender and fell perfectly into the path of the onrushing Roman Martinez who tucked the ball home and gave Estudiantes the lead. Duvan Zapata received a red card to take the hosts down to 10 men but they saw out the victory and consigned Arsenal to a third straight defeat.